First, there will be many pictures taken of you, your friends and the gifts at the shower. At this point in your pregnancy, you may be having a more difficult time getting clothes to fit, difficulty with moving around more and not feeling so attractive. Treat yourself before the baby shower. Get your nails and hair done, possibly buy a new outfit and/or even get a makeover. This will help you to feel better yourself as well as feeling up to being the center of attention! Don’t share the name of your unborn child unless you are more than sure that the name will not change. People love to give monogrammed gifts and it would be a shame to waste any of your gifts should you not be able to use them. Make sure that you have someone writing down the names of the guests and exactly what they gave to you and the baby. It would even be helpful if the hostess could print off a list of names and addresses ahead of time to help you when writing your thank you notes. Speaking of hostesses, don’t forget to get them a small gift or token of appreciation for all the work they have gone through to throw you the baby shower. It is just a small thank you for all their hard work. Designate someone to take pictures of everyone and the gifts. You will be very busy talking to everyone and opening gifts. Make sure someone, whom you trust to take good pictures, is ready and willing to do so for you to have great memories. Another great way to get pictures from your day is to create an original #Hashtag so that everyone can upload their pictures to be seen and printed off. Just remember to make it personal enough that other people are not using the same Hashtag name. When registering for items, don’t forget to ask other parents what they thought were good ideas, well used items or things to stay away from. You can also check out websites that offer feedback on baby products. Also be sure to register at places that has an easy to use return policy to ensure that you can get exactly what you want/need. Remember, you may get items that you do not want, need or like – always keep a happy face and say thank you. You can always return them or re-gift them. If you receive something that you do not know what it is or how to use it, don’t be afraid to ask what it is or how to use it. If this is your first baby, you may not be familiar with everything but may find that you are glad you asked as it may be a very useful product. Finally, if you receive diapers or wipes, don’t be upset or disappointed. You will find soon enough that diapers are the most useful item you will have and will always need. Your guest was thinking practical – you will really appreciate it later! Enjoy your special day and congratulations on being a new mommy! If you want to find more information or ideas, follow Gala Events Facility’s Pinterest board or our website: https://www.galafacility.com/ . 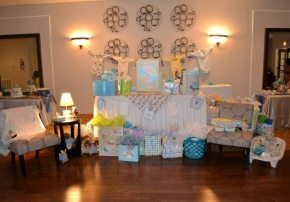 Our event facility caters to all types of parties including birthday parties, weddings and baby showers!